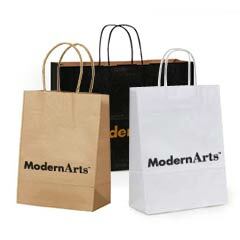 "Traditional" Shopping Bags, "Roll to Roll" or "Machine Made"
Stock Kraft Bag Styles in Assorted Sizes & Colors. Rush Delivery & Shipping Available. Custom Personalized Imprinted Stock Kraft Bags. Up to 2 Color Printing. 1-3 Week Production Time. Custom Manufactured & Imprinted to Your Specifications. 30 - 60 Day Production Timing. 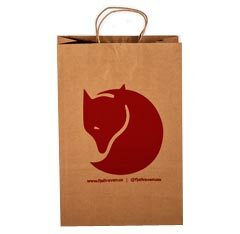 Kraft paper bags with twisted handles are the most cost-efficient solution to your custom shopping bag needs. 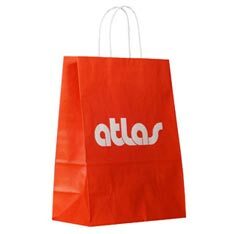 Manufactured by machine, these bags are available with a variety of handle options: paper twist, plastic or fabric knotted handles. Handles also come in a wide array of color offerings. You can chose from several base papers options including natural kraft, white kraft, or coated kraft. 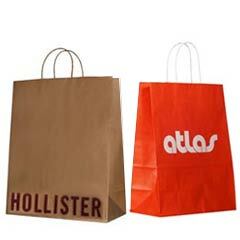 Custom printed machine shopping bags are normally not available with lamination. Recycled, environmentally friendly papers with 40% PCW (Post Consumer Content) which complies with most state and laws are also available. The method of printing for custom kraft bags is usually flexographic, roll to roll and up to 8 colors. For large quantities, other print options may be possible. Check with one of our packaging design specialists. Also, heat stamping is available for post printing, or once the bag has been converted. They are commonly used by department and specialty fashion stores, gourmet food stores, outlet stores and local retailers worldwide. 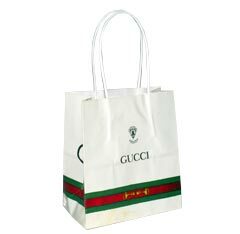 Efficient and capable of carrying substantial weights, these bags offer fantastic advertising opportunities to promote your brand and send the right eco-conscious message. This printing process uses raised image printing plates made from photopolymer or rubber, transferring ink from the plate to the substrate. This process is also called surface printing. Often Abbreviated as "Flexo". Pre-Printing: System is used for more complex detailed printing - including 4 color process, 120 line screen and up to 8 Colors. Pre-printing is usually done on a central impression press and not during the bag manufacturing process. The strength in the construction of these machine made paper shopping bags promotes reuse. Reusabilty is an important factor in eco-friendly packaging. 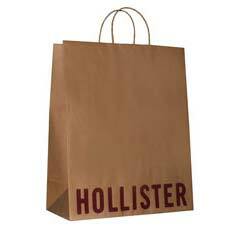 These bags can also easily be recycled in most standard community waste streams. Many local laws requiring 40% post consumer waste base materials combine with an increase in consumers seeking green packaging options - kraft bags are an excellent choice for environmentally conscious and compliant paper shopping bags. At this quantity level, bags are post-printed from stock inventory. This means the bags have already been constructed and converted from paper into a bag. 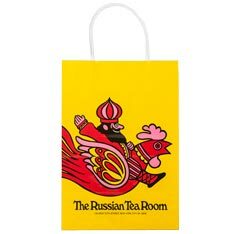 1 or 2 colors can be hot stamped or silk-screen imprinted on one or two faces of the bag. Printing capabilities at this quantity are limited and our customer service or design staff can review your requirements and guide you on your printing options. These options are also impacted by ink coverage and layout. More affordable than euro bags and often offer faster domestic turn-around. 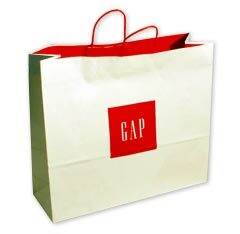 Bags can be imprinted from 1-8 colors to your specification. By Careful observation, he noticed that his customer's purchases were limited by what they could conveniently carry. So he set about devising a way to help them buy more purchases at one time. It took him four years to develop the right solution: a prefabricated package, inexpensive, easy to use and strong enough to carry up to seventy-five pounds worth of groceries.